As Telefónica continues to power towards Cape Town, PUMA’s Mar Mostro successfully rendezvoused with a cargo ship to accept enough fuel to allow the crew to motor towards the remote island of Tristan da Cunha. “This is our new best friend. This is life as we know it," PUMA Skipper Ken Read said. Green jerry cans of fuel were transferred using ropes as the crew of Mar Mostro held the boat steady about two boat lengths from the towering side of the ship. In calm seas the daylight operation went off without a hitch, although Read said it was one of the most nerve-wracking things he's ever done. The crew thanked the cargo ship with a package of t-shirts, re-hoisted their jury rig and continued on their way to the island. Meanwhile, Telefónica is just 1,614 nautical miles from the finish and computers are predicting her arrival in Cape Town on November 27. 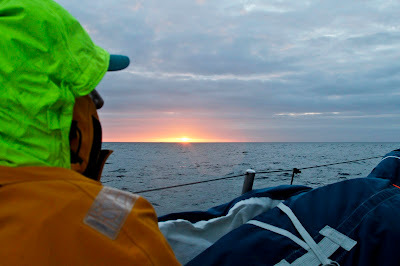 Yesterday was cold and quiet as the team approached the centre of the Saint Helena High. The highlight for the team was the first sighting of the majestic Albatross, the ocean wanderer whose solitary presence is a reminder of what it yet to come for the teams when they enter the vast wastes of the Southern Ocean. CAMPER with Emirates Team New Zealand lies 107 nm astern. Crewman Tony 'Trae' Rae, who earlier in the week operated on bowman Mike Pammenter’s face after he collided with the shrouds in heavy weather, confirms that his patient is doing well. Rae, one of two medics on board, trained for many hours in ambulances and hospitals to prepare for this race. “I never like to see anyone get injured and we don’t want that to happen to any of the crew as if any of them are down for any length of time, it’s not good for the boat. I’ve trained for those sorts of situations, so that when you come across those sorts of injuries or situations you can deal with it calmly and think through it. Time will tell if I have done a decent job or not,” Rae said. Groupama 4 is 317 nm further back. The team is not so optimistic on reaching the cold front in time to sweep them quickly towards the finish. “Even the optimistic ones [forecasts] are not so optimistic anymore,” MCM Yann Riou reports. The team continues on port tack as temperatures fall.